One of the oldest cities in the United States, Boston was founded on the Shawmut Peninsula in 1630 by Puritan settlers from England. It was the scene of several key events of the American Revolution, such as the Boston Massacre, the Boston Tea Party, the Battle of Bunker Hill, and the Siege of Boston. Upon U.S. independence from Great Britain, the city continued to be an important port and manufacturing hub, as well as a center for education and culture. Through land reclamation and municipal annexation, Boston has expanded beyond the original peninsula. Its rich history attracts many tourists, with Faneuil Hall alone drawing over 20 million visitors per year. Boston's many firsts include the United States' first public school, Boston Latin School (1635), first subway system (1897), and first public park (1634). The area's many colleges and universities make Boston an international center of higher education, including law, medicine, engineering, and business, and the city is considered to be a world leader in innovation and entrepreneurship. Boston's economic base also includes finance, professional and business services, biotechnology, information technology, and government activities. Households in the city claim the highest average rate of philanthropy in the United States; businesses and institutions rank among the top in the country for environmental sustainability and investment. The city has one of the highest costs of living in the United States, though it remains high on world livability rankings. Boston is the county seat of Suffolk County, although the county government was disbanded on July 1, 1999. Boston's early European settlers had first called the area Trimountaine (after its "three mountains"—only traces of which remain today) but later renamed it Boston after Boston, Lincolnshire, England, the origin of several prominent colonists. The renaming, on September 7, 1630 (Old Style),[lower-alpha 2] was by Puritan colonists from England, who had moved over from Charlestown earlier that year in quest of fresh water. Their settlement was initially limited to the Shawmut Peninsula, at that time surrounded by the Massachusetts Bay and Charles River and connected to the mainland by a narrow isthmus. The peninsula is known to have been inhabited as early as 5000 BC. After The Great Boston Fire of 1872, workers used building rubble as landfill along the downtown waterfront. During the mid-to-late 19th century, workers filled almost 600 acres (2.4 km2) of brackish Charles River marshlands west of Boston Common with gravel brought by rail from the hills of Needham Heights. The city annexed the adjacent towns of South Boston (1804), East Boston (1836), Roxbury (1868), Dorchester (including present day Mattapan and a portion of South Boston) (1870), Brighton (including present day Allston) (1874), West Roxbury (including present day Jamaica Plain and Roslindale) (1874), Charlestown (1874), and Hyde Park (1912). Other proposals, for the annexation of Brookline, Cambridge, and Chelsea, were unsuccessful. By the 1970s, the city's economy had recovered after 30 years of economic downturn. A large number of high rises were constructed in the Financial District and in Boston's Back Bay during this time period. This boom continued into the mid-1980s and resumed after a few pauses. Hospitals such as Massachusetts General Hospital, Beth Israel Deaconess Medical Center, and Brigham and Women's Hospital lead the nation in medical innovation and patient care. Schools such as Boston College, Boston University, the Harvard Medical School, Northeastern University, Wentworth Institute of Technology, Berklee College of Music and Boston Conservatory attract students to the area. Nevertheless, the city experienced conflict starting in 1974 over desegregation busing, which resulted in unrest and violence around public schools throughout the mid-1970s. Boston has an area of 89.6 square miles (232.1 km2)—48.4 square miles (125.4 km2) (54.0%) of land and 41.2 square miles (106.7 km2) (46.0%) of water. The city's official elevation, as measured at Logan International Airport, is 19 ft (5.8 m) above sea level. 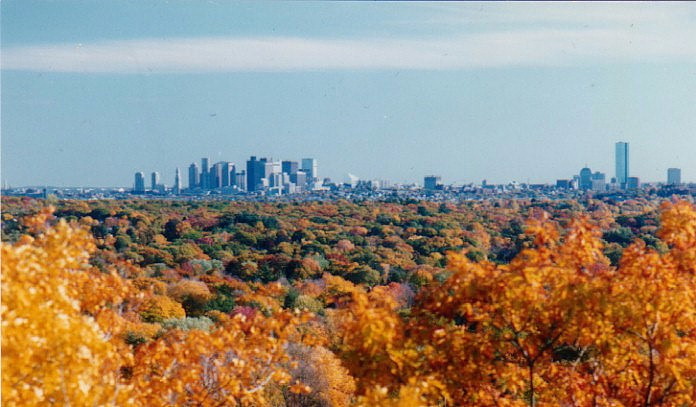 The highest point in Boston is Bellevue Hill at 330 feet (100 m) above sea level, and the lowest point is at sea level. Situated onshore of the Atlantic Ocean, Boston is the only state capital in the contiguous United States with an oceanic coastline. The John Hancock Tower is the tallest building in Boston, with a roof height of 790 feet (240 m). Boston is sometimes called a "city of neighborhoods" because of the profusion of diverse subsections; the city government's Office of Neighborhood Services has officially designated 23 neighborhoods. More than two-thirds of inner Boston's modern land area did not exist when the city was founded, but was created via the gradual filling in of the surrounding tidal areas over the centuries, notably with earth from the leveling or lowering of Boston's three original hills (the "Trimountain", after which Tremont Street is named), and with gravel brought by train from Needham to fill the Back Bay. Downtown and its immediate surroundings consist largely of low-rise (often Federal style and Greek Revival) masonry buildings, interspersed with modern highrises, notably in the Financial District, Government Center, and South Boston. Back Bay includes many prominent landmarks, such as the Boston Public Library, Christian Science Center, Copley Square, Newbury Street, and New England's two tallest buildings—the John Hancock Tower and the Prudential Center. Near the John Hancock Tower is the old John Hancock Building with its prominent illuminated beacon, the color of which forecasts the weather. Smaller commercial areas are interspersed among areas of single-family homes and wooden/brick multi-family row houses. The South End Historic District is the largest surviving contiguous Victorian-era neighborhood in the US. The geography of downtown and South Boston was particularly impacted by the Central Artery/Tunnel Project (known unofficially as the "Big Dig"), which allowed for the removal of the unsightly elevated Central Artery and the incorporation of new green spaces and open areas. Normal distribution of winter snowfall counts collected at Logan International Airport from 1920–2016. Data is from NWS and NOAA and was procured at The Weather Warehouse. Statistical mean is approximately 43.4 inches and one standard deviation is approximately 22 inches. Note: Winter is defined here as October 1st through April 30th. Under the Köppen climate classification, Boston has a humid continental climate (Köppen Dfa) with some maritime influence. Despite its climate, the city lies at the transition between USDA plant hardiness zones 6b (most of the city) and 7a (Downtown, South Boston, and East Boston neighborhoods). Summers are typically warm to hot, rainy, and humid, while winters oscillate between periods of cold rain and snow, with cold temperatures. Spring and fall are usually mild, with varying conditions dependent on wind direction and jet stream positioning. Prevailing wind patterns that blow offshore minimize the influence of the Atlantic Ocean. The hottest month is July, with a mean temperature of 73.4 °F (23.0 °C). The coldest month is January, with a mean of 29.0 °F (−1.7 °C). Periods exceeding 90 °F (32 °C) in summer and below freezing in winter are not uncommon but rarely extended, with about 13 and 25 days per year seeing each, respectively. The most recent sub-0 °F (−18 °C) reading occurred on February 14, 2016, when the temperature dipped down to −9 °F (−23 °C), the coldest reading since 1957. In addition, several decades may pass between 100 °F (38 °C) readings, with the most recent such occurrence on July 22, 2011, when the temperature reached 103 °F (39 °C). The city's average window for freezing temperatures is November 9 through April 5. [lower-alpha 3] Official temperature records have ranged from −18 °F (−28 °C) on February 9, 1934, up to 104 °F (40 °C) on July 4, 1911; the record cold daily maximum is 2 °F (−17 °C) on December 30, 1917, while, conversely, the record warm daily minimum is 83 °F (28 °C) on August 2, 1975. Fog is fairly common, particularly in spring and early summer, and the occasional tropical storm or hurricane can threaten the region, especially in late summer and early autumn. Due to its situation along the North Atlantic, the city often receives sea breezes, especially in the late spring, when water temperatures are still quite cold and temperatures at the coast can be more than 20 °F (11 °C) colder than a few miles inland, sometimes dropping by that amount near midday. Thunderstorms occur from May to September, that are occasionally severe with large hail, damaging winds and heavy downpours. Although downtown Boston has never been struck by a violent tornado, the city itself has experienced many tornado warnings. Damaging storms are more common to areas north, west, and northwest of the city. Boston has a relatively sunny climate for a coastal city at its latitude, averaging over 2,600 hours of sunshine per annum. In 2016, Boston was estimated to have 667,137 residents (a density of 13,841 persons/sq mile, or 5,344/km2) living in 272,481 housing units— an 8% population increase over 2010. The city is the third most densely populated large U.S. city of over half a million residents. Some 1.2 million persons may be within Boston's boundaries during work hours, and as many as 2 million during special events. This fluctuation of people is caused by hundreds of thousands of suburban residents who travel to the city for work, education, health care, and special events. In 1950, Whites represented 94.7% of Boston's population. From the 1950s to the end of the 20th century, the proportion of non-Hispanic whites in the city declined; in 2000, non-Hispanic whites made up 49.5% of the city's population, making the city majority-minority for the first time. However, in the 21st century, the city has experienced significant gentrification, in which affluent whites have moved into formerly non-white areas. In 2006, the US Census Bureau estimated that non-Hispanic whites again formed a slight majority. But as of 2010, in part due to the housing crash, as well as increased efforts to make more affordable housing more available, the non-white population has rebounded. This may also have to do with increased Latin American and Asian populations and more clarity surrounding US Census statistics, which indicate a non-Hispanic white population of 47 percent (some reports give slightly lower figures). People of Irish descent form the largest single ethnic group in the city, making up 15.8% of the population, followed by Italians, accounting for 8.3% of the population. People of West Indian and Caribbean ancestry are another sizable group, at 6.0%, about half of whom are of Haitian ancestry. Over 27,000 Chinese Americans made their home in Boston city proper in 2013, and the city hosts a growing Chinatown accommodating heavily traveled Chinese-owned bus lines to and from Chinatown, Manhattan in New York City. Some neighborhoods, such as Dorchester, have received an influx of people of Vietnamese ancestry in recent decades. Neighborhoods such as Jamaica Plain and Roslindale have experienced a growing number of Dominican Americans. The city and greater area also has a growing immigrant population of South Asians, including the tenth-largest Indian community in the country. The city, especially the East Boston neighborhood, has a significant Hispanic community. In 2010, Hispanics in Boston were mostly of Puerto Rican (30,506 or 4.9% of total city population), Dominican (25,648 or 4.2% of total city population), Salvadoran (10,850 or 1.8% of city population), Colombian (6,649 or 1.1% of total city population), Mexican (5,961 or 1.0% of total city population), and Guatemalan (4,451 or 0.7% of total city population) ethnic origin. Hispanics of all national origins totaled 107,917 in 2010. In Greater Boston, these numbers grew significantly, with Puerto Ricans numbering 175,000+, Dominicans 95,000+, Salvadorans 40,000+, Guatemalans 31,000+, Mexicans 25,000+, and Colombians numbering 22,000+. Other important industries are financial services, especially mutual funds and insurance. Boston-based Fidelity Investments helped popularize the mutual fund in the 1980s and has made Boston one of the top financial cities in the United States. The city is home to the headquarters of Santander Bank, and Boston is a center for venture capital firms. State Street Corporation, which specializes in asset management and custody services, is based in the city. Boston is a printing and publishing center — Houghton Mifflin Harcourt is headquartered within the city, along with Bedford-St. Martin's Press and Beacon Press. Pearson PLC publishing units also employ several hundred people in Boston. The city is home to three major convention centers—the Hynes Convention Center in the Back Bay, and the Seaport World Trade Center and Boston Convention and Exhibition Center on the South Boston waterfront. The General Electric Corporation announced in January 2016 its decision to move the company's global headquarters to the Seaport District in Boston, from Fairfield, Connecticut, citing factors including Boston's preeminence in the realm of higher education. The Boston Public Schools enrolls 57,000 students attending 145 schools, including the renowned Boston Latin Academy, John D. O'Bryant School of Math & Science, and Boston Latin School. The Boston Latin School, established 1635, is the oldest public high school in the US; Boston also operates the United States' second oldest public high school, and its oldest public elementary school. The system's students are 40% Hispanic or Latino, 35% Black or African American, 13% White, and 9% Asian. There are private, parochial, and charter schools as well, and approximately 3,300 minority students attend participating suburban schools through the Metropolitan Educational Opportunity Council. Some of the most renowned and highly ranked universities in the world are located in the Boston area. Three universities with a major presence in the city are located just outside of Boston in the Cambridge/Somerville area known as the Brainpower Triangle. Harvard University, the nation's oldest institute of higher education, is centered across the Charles River in Cambridge but has the majority of its land holdings and a substantial amount of its educational activities in Boston. Its business, medical, dental, and public health schools are located in Boston's Allston and Longwood neighborhoods. Harvard has plans for additional expansion into Allston. The Massachusetts Institute of Technology (MIT), which originated in Boston and was long known as "Boston Tech", moved across the river to Cambridge in 1916. Tufts University, whose main campus is north of the city in Somerville and Medford, locates its medical and dental school in Boston's Chinatown at Tufts Medical Center, a 451-bed academic medical institution that is home to both a full-service hospital for adults and the Floating Hospital for Children. Four members of the Association of American Universities are in Greater Boston (more than any other metropolitan area): Harvard University, the Massachusetts Institute of Technology, Boston University, and Brandeis University. Hospitals, universities, and research institutions in Greater Boston received more than $1.77 billion in National Institutes of Health grants in 2013, more money than any other American metropolitan area. Greater Boston has more than 100 colleges and universities, with 250,000 students enrolled in Boston and Cambridge alone. Its largest private universities include Boston University (the city's fourth-largest employer), with its main campus along Commonwealth Avenue and a medical campus in the South End; Northeastern University in the Fenway area; Suffolk University near Beacon Hill, which includes law school and business school; and Boston College, which straddles the Boston (Brighton)–Newton border. Boston's only public university is the University of Massachusetts Boston, on Columbia Point in Dorchester. Roxbury Community College and Bunker Hill Community College are the city's two public community colleges. Altogether, Boston's colleges and universities employ over 42,600 people, accounting for nearly 7 percent of the city's workforce. In 2008, there were 62 reported homicides. Through December 20 each of 2014 and 2015, the Boston Police Department reported 52 and 39 homicides, respectively. Boston shares many cultural roots with greater New England, including a dialect of the non-rhotic Eastern New England accent known as Boston English, and a regional cuisine with a large emphasis on seafood, salt, and dairy products. Boston also has its own collection of neologisms known as Boston slang. Music is afforded a high degree of civic support in Boston. The Boston Symphony Orchestra is one of the "Big Five," a group of the greatest American orchestras, and the classical music magazine Gramophone called it one of the "world's best" orchestras. Symphony Hall (located west of Back Bay) is home to the Boston Symphony Orchestra, (and the related Boston Youth Symphony Orchestra, which is the largest youth orchestra in the nation) and the Boston Pops Orchestra. The British newspaper The Guardian called Boston Symphony Hall "one of the top venues for classical music in the world," adding that "Symphony Hall in Boston was where science became an essential part of concert hall design." Other concerts are held at the New England Conservatory's Jordan Hall. The Boston Ballet performs at the Boston Opera House. Other performing-arts organizations located in the city include the Boston Lyric Opera Company, Opera Boston, Boston Baroque (the first permanent Baroque orchestra in the US), and the Handel and Haydn Society (one of the oldest choral companies in the United States). The city is a center for contemporary classical music with a number of performing groups, several of which are associated with the city's conservatories and universities. These include the Boston Modern Orchestra Project and Boston Musica Viva. Several theaters are located in or near the Theater District south of Boston Common, including the Cutler Majestic Theatre, Citi Performing Arts Center, the Colonial Theater, and the Orpheum Theatre. Because of the city's prominent role in the American Revolution, several historic sites relating to that period are preserved as part of the Boston National Historical Park. Many are found along the Freedom Trail, which is marked by a red line of bricks embedded in the ground. The city is also home to several art museums and galleries, including the Museum of Fine Arts and the Isabella Stewart Gardner Museum. The Institute of Contemporary Art is housed in a contemporary building designed by Diller Scofidio + Renfro in the Seaport District. Boston's South End Art and Design District, SoWa, and Newbury St. are both art gallery destinations. is the location of the University of Massachusetts Boston, the Edward M. Kennedy Institute for the United States Senate, the John F. Kennedy Presidential Library and Museum, and the Massachusetts Archives and Commonwealth Museum. The Boston Athenæum (one of the oldest independent libraries in the United States), Boston Children's Museum, Bull & Finch Pub (whose building is known from the television show Cheers), Museum of Science, and the New England Aquarium are within the city. Some of the cleaner energy facilities in Boston include the Allston green district, with three ecologically compatible housing facilities. Boston is also breaking ground on multiple green affordable housing facilities to help reduce the carbon footprint of the city while simultaneously making these initiatives financially available to a greater population. Boston's climate plan is updated every three years and was most recently modified in 2013. This legislature includes the Building Energy Reporting and Disclosure Ordinance, which requires the city's larger buildings to disclose their yearly energy and water use statistics and partake in an energy assessment every five years. These statistics are made public by the city, thereby increasing incentives for buildings to be more environmentally conscious. Many older buildings in certain areas of Boston are supported by wooden piles driven into the area's fill; these piles remain sound if submerged in water, but are subject to dry rot if exposed to air for long periods. Groundwater levels have been dropping, to varying degrees, in many areas of the city, due in part to an increase in the amount of rainwater discharged directly into sewers rather than absorbed by the ground. A city agency, the Boston Groundwater Trust, coordinates monitoring of groundwater levels throughout the city via a network of public and private monitoring wells. However, Boston's drinking water supply, from the Quabbin and Wachusett Reservoirs to the west, is one of the very few in the country so pure as to satisfy federal water quality standards without filtration. Boston has teams in the four major North American professional sports leagues plus Major League Soccer, and has won 36 championships in these leagues, As of 2014. It is one of six cities (along with Chicago, Detroit, Los Angeles, New York and Philadelphia) to have won championships in all four major sports. It has been suggested that Boston is the new "TitleTown, USA", as the city's professional sports teams have won nine championships since 2001: Patriots (2001, 2003, 2004, and 2014), Red Sox (2004, 2007, and 2013), Celtics (2008), and Bruins (2011). This love of sports has made Boston the United States Olympic Committee's choice to bid to hold the 2024 Summer Olympic Games, but the city cited financial concerns when it withdrew its bid on July 27, 2015. While they have played in suburban Foxborough since 1971, the New England Patriots of the National Football League were founded in 1960 as the Boston Patriots, changing their name after relocating. The team won the Super Bowl after the 2001, 2003, 2004, and 2014 seasons. They share Gillette Stadium with the New England Revolution of Major League Soccer. The Boston Breakers of Women's Professional Soccer, which formed in 2009, play their home games at Dilboy Stadium in Somerville. The Boston Storm of the United Women's Lacrosse League was formed in 2015. The Boston television DMA, which also includes Manchester, New Hampshire, is the 8th largest in the United States. The city is served by stations representing every major American network, including WBZ-TV 4 and its sister station WSBK-TV 38 (the former a CBS O&O, the latter an MyNetwork TV affiliate), WCVB-TV 5 and its sister station WMUR-TV 9 (both ABC), WHDH 7 (NBC; to become independent on January 1, 2017), WFXT 25 (Fox), and WLVI 56 (The CW). The city is also home to PBS station WGBH-TV 2, a major producer of PBS programs, which also operates WGBX 44. Spanish-language television networks, including MundoFox (WFXZ-CD 24), Univision (WUNI 27), Telemundo (WNEU 60), and UniMás (WUTF-DT 66), have a presence in the region, with WNEU and WUTF serving as network owned-and-operated stations. NBC plans to buy a television station to become an NBC O&O; however, it is unknown which station will be brought to NBCUniversal. Most of the area's television stations have their transmitters in nearby Needham and Newton along the Route 128 corridor. Six Boston television stations are carried by Canadian satellite television provider Bell TV and by cable television providers in Canada. Nicknamed "The Walking City", Boston hosts more pedestrian commuters than do other comparably populated cities. Owing to factors such as the compactness of the city and large student population, 13 percent of the population commutes by foot, making it the highest percentage of pedestrian commuters in the country out of the major American cities. In 2011, Walk Score ranked Boston the third most walkable city in the United States. As of 2015, Walk Score still ranks Boston as the third most walkable US city, with a Walk Score of 80, a Transit Score of 75, and a Bike Score of 70. ^ Thomas, G. Scott. "Boston's population stays flat, but still ranks as 10th-largest in U.S. (BBJ DataCenter)". http://www.bizjournals.com/boston/blog/bbj_research_alert/2012/11/bostons-population-stays-flat-but.html?page=all. Retrieved May 4, 2015. ^ a b c "Population and Housing Occupancy Status: 2010 – State – County Subdivision, 2010 Census Redistricting Data (Public Law 94-171) Summary File". United States Census Bureau. http://factfinder2.census.gov/faces/tableservices/jsf/pages/productview.xhtml?pid=DEC_10_PL_GCTPL2.ST16&prodType=table. Retrieved March 23, 2011. ^ "State & County QuickFacts – Boston (city), Massachusetts". United States Census Bureau. January 10, 2013. http://quickfacts.census.gov/qfd/states/25/2507000.html. Retrieved February 5, 2013. ^ "Alphabetically sorted list of Census 2000 Urbanized Areas" (TXT). United States Census Bureau, Geography Division. http://www.census.gov/geo/www/ua/ua2k.txt. Retrieved April 11, 2009. ^ a b "Table 1. Annual Estimates of the Population of Metropolitan and Micropolitan Statistical Areas: April 1, 2010 to July 1, 2011 (CBSA-EST2011-01)" (CSV). United States Census Bureau, Population Division. http://www.census.gov/popest/data/metro/totals/2011/tables/CBSA-EST2011-01.csv. Retrieved January 18, 2013. ^ "Table 2. Annual Estimates of the Population of Combined Statistical Areas: April 1, 2010 to July 1, 2011 (CBSA-EST2011-02)" (CSV). United States Census Bureau, Population Division. http://www.census.gov/popest/data/metro/totals/2011/tables/CBSA-EST2011-02.csv. Retrieved January 18, 2013. ^ "ZIP Code Lookup – Search By City". United States Postal Service. http://zip4.usps.com/zip4/citytown.jsp. Retrieved April 20, 2009. ^ "Population and Housing Occupancy Status: 2010 – State – County Subdivision 2010 Census Redistricting Data (Public Law 94-171) Summary File". United States Census Bureau. 2010. http://factfinder2.census.gov/faces/tableservices/jsf/pages/productview.xhtml?pid=DEC_10_PL_GCTPL2.ST16&prodType=table. Retrieved March 4, 2013. ^ "Boston city, Massachusetts QuickFacts". United States Census Bureau. https://www.census.gov/quickfacts/table/PST045215/2507000. Retrieved June 17, 2016. ^ "2014 American Community Survey 1-Year Estimates". United States Census Bureau. http://factfinder.census.gov/bkmk/table/1.0/en/ACS/14_1YR/S0101/330M200US148. Retrieved April 1, 2016. ^ Banner, David. "Boston History – The History of Boston, Massachusetts". SearchBoston. http://www.searchboston.com/articles/history.html. Retrieved April 20, 2009. ^ a b "About Boston". City of Boston. http://www.cityofboston.gov/visitors/about.asp. Retrieved May 1, 2016. ^ "Top 25 Most Visited Tourist Destinations in America". The Travelers Zone. May 10, 2008. http://www.thetravelerszone.com/travel-destinations/top-25-most-visited-tourist-destinations-in-america/. Retrieved February 14, 2013. ^ a b c "BPS at a Glance". Boston Public Schools. March 14, 2007. Archived from the original on April 3, 2007. https://web.archive.org/web/20070403011648/http://boston.k12.ma.us/bps/bpsglance.asp. Retrieved April 28, 2007. ^  Accessed May 12, 2016. ^ "Venture Investment - Regional Aggregate Data". National Venture Capital Association and PricewaterhouseCoopers. http://nvca.org/research/venture-investment/. Retrieved April 22, 2016. ^ a b Kirsner, Scott (July 20, 2010). "Boston is #1 ... But will we hold on to the top spot? – Innovation Economy". The Boston Globe. http://www.boston.com/business/technology/innoeco/2010/07/boston_is_1but_will_we_hold_on.html. Retrieved August 30, 2010. ^ a b Yeandle, Mark (March 2011). "The Global Financial Centres Index 9" (PDF). The Z/Yen Group. p. 4. http://www.zyen.com/GFCI/GFCI%209.pdf. Retrieved January 31, 2013. ^ "The Boston Economy in 2010". Boston Redevelopment Authority. January 2011. Archived from the original on July 30, 2012. https://web.archive.org/web/20120730182721/http://www.bostonredevelopmentauthority.org/PDF/ResearchPublications//TheBostonEconomyin2010.pdf. Retrieved March 5, 2013. ^ "Transfer of Wealth in Boston". The Boston Foundation. March 2013. http://www.tbf.org/~/media/TBFOrg/Files/Reports/Wealth%20Transfer%20Report%202013.pdf. Retrieved December 6, 2015. ^ "Boston Ranked Most Energy-Efficient City in the United States". City Government of Boston. September 18, 2013. http://www.cityofboston.gov/news/Default.aspx?id=6332. Retrieved December 6, 2015. ^ a b Heudorfer, Bonnie; Bluestone, Barry (2004). "The Greater Boston Housing Report Card" (PDF). Center for Urban and Regional Policy (CURP), Northeastern University. p. 6. http://www.tbf.org/uploadedFiles/Housing%20Report%20Card%202004.pdf. Retrieved February 19, 2007. ^ "Quality of Living global city rankings 2010 – Mercer survey". Mercer. May 26, 2010. Archived from the original on August 12, 2011. https://web.archive.org/web/20110812003533/http://www.mercer.com/referencecontent.htm?idContent=1173105. Retrieved August 20, 2011. ^ Drake, Samuel Adams (1872). Old Landmarks and Historic Personages of Boston. p. 6. http://quod.lib.umich.edu/m/moa/AFJ7482.0001.001/24. ^ "Archives Guide ~ Town of Boston". City of Boston. 2013. http://www.cityofboston.gov/archivesandrecords/guide/town.asp. Retrieved February 13, 2013. ^ "Archaeology of the Central Artery Project: Highway to the Past". Commonwealth Museum – Massachusetts Historical Commission. 2007. http://www.sec.state.ma.us/mhc/mhcexh/exhidx.htm. Retrieved April 6, 2007. ^ ""Growth" to Boston in its Heyday, 1640s to 1730s" (PDF). Boston History & Innovation Collaborative. 2006. p. 2. http://bostonhistorycollaborative.com/pdf/Era2.pdf. Retrieved March 5, 2013. ^ "New England's hidden history". http://archive.boston.com/bostonglobe/ideas/articles/2010/09/26/new_englands_hidden_history/. ^ "Colonial Boston". University Archives. Archived from the original on February 7, 2009. https://web.archive.org/web/20090207181331/http://www.universityarchives.com/browse.asp?sn=39159-001&show=True&thumbnails=True. Retrieved May 2, 2009. ^ a b c d "Boston Economy". City-Data.com. Advameg Inc.. 2007. http://www.city-data.com/us-cities/The-Northeast/Boston-Economy.html. Retrieved June 20, 2007. ^ "Home page" (Exhibition at Boston Public Library and Massachusetts Historical Society). Forgotten Chapters of Boston's Literary History. The Trustees of Boston College. March 28 – July 30, 2012. http://www.bostonliteraryhistory.com. Retrieved May 22, 2012. ^ "An Interactive Map of Literary Boston: 1794–1862" (Exhibition). Forgotten Chapters of Boston's Literary History. The Trustees of Boston College. March 28 – July 30, 2012. http://bostonliteraryhistory.com/sites/default/files/bostonliteraryhistorymap.pdf. Retrieved May 22, 2012. ^ Dilworth, Richardson. Cities in American Political History. Sage Publications. https://books.google.com/books?id=0dL7vPC8G7YC&lpg=PA28&ots=4lXydPtg4g&dq=&pg=PA28#v=onepage&q&f=false. ^ "Boston African American National Historic Site". National Park Service. April 28, 2007. http://www.nps.gov/boaf/. Retrieved May 8, 2007. ^ "Fugitive Slave Law". The Massachusetts Historical Society. http://www.masshist.org/longroad/01slavery/fsl.htm. Retrieved May 2, 2009. ^ "The "Trial" of Anthony Burns". The Massachusetts Historical Society. http://www.masshist.org/longroad/01slavery/burns.htm. Retrieved May 2, 2009. ^ "150th Anniversary of Anthony Burns Fugitive Slave Case". Suffolk University. April 24, 2004. Archived from the original on 2008-05-20. https://web.archive.org/web/20080520121923/http://www.suffolk.edu/16075.html. Retrieved May 2, 2009. ^ a b State Street Trust Company; Walton Advertising & Printing Company (1922) (TXT). Boston: one hundred years a city. 2. Boston: State Street Trust Company. https://archive.org/stream/bostononehundred02stat/bostononehundred02stat_djvu.txt. Retrieved April 20, 2009. ^ "People & Events: Boston's Immigrant Population". WGBH/PBS Online (American Experience). 2003. http://www.pbs.org/wgbh/amex/murder/peopleevents/p_immigrants.html. Retrieved May 4, 2007. ^ "Immigration Records". The National Archives. http://www.archives.gov/genealogy/immigration/passenger-arrival.html. Retrieved January 7, 2009. ^ Puleo, Stephen (2007). "Epilogue: Today". The Boston Italians (illustrated ed.). Beacon Press. ISBN 978-0-8070-5036-1. https://books.google.com/books?id=jET-HIcybREC&printsec=frontcover#PPA281,M1. Retrieved May 16, 2009. ^ "Boston People". City-Data.com. Advameg Inc.. 2007. http://www.city-data.com/world-cities/Boston-People.html. Retrieved May 5, 2007. ^ a b "The History of Land Fill in Boston". iBoston.org. 2006. http://www.iboston.org/rg/backbayImap.htm. Retrieved January 9, 2006. . Also see Howe, Jeffery (1996). "Boston: History of the Landfills". Boston College. http://www.bc.edu/bc_org/avp/cas/fnart/fa267/bos_fill2.html. Retrieved April 30, 2007. ^ "Boston's Annexation Schemes. ; Proposal To Absorb Cambridge And Other Near-By Towns". The New York Times: p. 11. March 26, 1892. Archived from the original on March 27, 1892. http://query.nytimes.com/mem/archive-free/pdf?res=9C05E1DC1F39E233A25754C2A9659C94639ED7CF. Retrieved August 21, 2010. ^ Rezendes, Michael (October 13, 1991). "Has the time for Chelsea's annexation to Boston come? The Hub hasn't grown since 1912, and something has to follow that beleaguered community's receivership". The Boston Globe: p. 80. http://pqasb.pqarchiver.com/boston/access/59275776.html?FMT=ABS&date=Oct%2013,%201991. Retrieved August 22, 2010. ^ Estes, Andrea; Cafasso, Ed (September 9, 1991). "Flynn offers to annex Chelsea". Boston Herald: p. 1. http://pqasb.pqarchiver.com/bostonherald/access/69025902.html?FMT=ABS&FMTS=ABS:FT&date=Sep+9%2C+1991&author=ANDREA+ESTES+and+ED+CAFASSO&pub=Boston+Herald&edition=&startpage=001&desc=Flynn+offers+to+annex+Chelsea. Retrieved August 22, 2010. ^ Collins, Monica (August 7, 2005). "Born Again". The Boston Globe. http://www.boston.com/news/globe/magazine/articles/2005/08/07/born_again/. Retrieved May 8, 2007. ^ Feeney, Mark; Mehegan, David (April 15, 2005). "Atlantic, 148-year institution, leaving city". The Boston Globe. http://www.boston.com/news/local/articles/2005/04/15/atlantic_148_year_institution_leaving_city/. Retrieved March 31, 2007. ^ "FleetBoston, Bank of America Merger Approved by Fed". The Boston Globe. March 9, 2004. http://www.boston.com/business/globe/articles/2004/03/09/fleetboston_bank_of_america_merger_approved_by_fed/. Retrieved March 5, 2013. ^ Abelson, Jenn; Palmer, Jr., Thomas C. (July 29, 2005). "It's Official: Filene's Brand Will Be Gone". The Boston Globe. http://www.boston.com/business/globe/articles/2005/07/29/its_official_filenes_brand_will_be_gone/. Retrieved March 5, 2013. ^ Glaberson, William (June 11, 1993). "Largest Newspaper Deal in U.S. – N.Y. Times Buys Boston Globe for $1.1 Billion". Pittsburgh Post-Gazette: p. B-12. https://news.google.com/newspapers?id=6IJIAAAAIBAJ&sjid=Tm4DAAAAIBAJ&pg=4346,4610151&dq=new+york+times+buys+boston+globe&hl=en. Retrieved March 5, 2013. ^ Hampson, Rick (April 19, 2005). "Studies: Gentrification a boost for everyone". USA Today. http://www.usatoday.com/news/nation/2005-04-19-gentrification_x.htm. Retrieved May 2, 2009. ^ "Cost of Living Index for Selected U.S. Cities, 2005". Information Please Database. Pearson Education. 2007. http://www.infoplease.com/ipa/A0883960.html. Retrieved May 2, 2009. ^ "Worldwide Cost of Living Survey 2011 – City Ranking". Mercer. July 12, 2011. http://www.mercer.com/press-releases/1420615. Retrieved February 21, 2013. ^ "2011 Quality of Living worldwide city rankings – Mercer survey". Mercer. November 29, 2011. http://www.mercer.com/press-releases/quality-of-living-report-2011. Retrieved January 29, 2012. ^ a b McConville, Christine (April 23, 2013). "Marathon injury toll jumps to 260". Boston Herald. http://bostonherald.com/news_opinion/local_coverage/2013/04/marathon_injury_toll_jumps_to_260. Retrieved April 24, 2013. ^ "Elevation data – Boston". U.S. Geological Survey. 2007. http://geonames.usgs.gov/pls/gnispublic/f?p=gnispq:3:::NO::P3_FID:617565. ^ "Bellevue Hill, Massachusetts". Peakbagger.com. http://www.peakbagger.com/peak.aspx?pid=6759. ^ United States Embassy. "Boston, Massachusetts: America's City of Firsts". http://iipdigital.usembassy.gov/st/english/pamphlet/2013/08/20130829281955.html#axzz3vj6MuW1s. Retrieved December 29, 2015. ^ "Kings Chapel Burying Ground, USGS Boston South (MA) Topo Map". TopoZone. 2006. http://www.topozone.com/map.asp?lat=42.35833&lon=-71.06028. Retrieved January 6, 2016. ^ "Official list of Boston neighborhoods". Cityofboston.gov. March 24, 2011. http://www.cityofboston.gov/neighborhoods/default.asp. Retrieved September 1, 2012. ^ "Boston Skyscrapers". Emporis.com. 2005. http://www.emporis.com/en/wm/ci/?id=101045. Retrieved May 15, 2005. ^ "Our History". South End Historical Society. 2013. http://www.southendhistoricalsociety.org/our-history/. Retrieved February 17, 2013. ^ a b c "Weather". City of Boston Film Bureau. 2007. Archived from the original on 2013-02-01. https://web.archive.org/web/20130201010317/http://www.cityofboston.gov/arts/film/weather.asp. Retrieved April 29, 2007. ^ "Threaded Extremes". National Weather Service. http://threadex.rcc-acis.org/. Retrieved June 28, 2010. ^ "Massachusetts – Climate". City-Data.com. Advameg Inc.. 2005. http://www.city-data.com/states/Massachusetts-Climate.html. Retrieved April 29, 2007. ^ "May in the Northeast". Intellicast.com. 2003. Archived from the original on April 29, 2007. https://web.archive.org/web/20070429165729/http://www.intellicast.com/Almanac/Northeast/May/. Retrieved April 29, 2007. ^ Wangsness, Lisa (October 30, 2005). "Snowstorm packs October surprise". The Boston Globe. http://www.boston.com/news/weather/articles/2005/10/30/snowstorm_packs_october_surprise/. Retrieved April 29, 2007. ^ Ryan, Andrew (July 11, 2007). "Sea breeze keeps Boston 25 degrees cooler while others swelter". The Boston Globe. Archived from the original on November 7, 2013. https://web.archive.org/web/20131107051159/http://www.boston.com/news/globe/city_region/breaking_news/2007/07/sea_breeze_keep.html. Retrieved March 31, 2009. ^ Ryan, Andrew (June 9, 2008). "Boston sea breeze drops temperature 20 degrees in 20 minutes". The Boston Globe. Archived from the original on April 13, 2014. https://web.archive.org/web/20140413184438/http://www.boston.com/news/local/breaking_news/2008/06/boston_sea_bree.html. Retrieved March 31, 2009. ^ "Tornadoes in Massachusetts". Tornado History Project. 2013. http://www.tornadohistoryproject.com/tornado/Massachusetts. Retrieved February 24, 2013. ^ United States Census Bureau. "Table 3. Annual Estimates of the Resident Population for Incorporated Places in Massachusetts: April 1, 2010 to July 1, 2011 (SUB-EST2011-03-25)". http://www.census.gov/popest/data/cities/totals/2011/tables/SUB-EST2011-03-25.csv. Retrieved January 18, 2013. ^ "Boston's Population Doubles – Every Day" (PDF). Boston Redevelopment Authority – Insight Reports. December 1996. Archived from the original on July 23, 2013. https://web.archive.org/web/20130723053618/http://www.bostonredevelopmentauthority.org/PDF/ResearchPublications//pdr96-1.pdf. Retrieved May 6, 2012. ^ a b "Boston city, Massachusetts—DP02, Selected Social Characteristics in the United States 2007–2011 American Community Surver 5-Year Estimates". United States Census Bureau. 2011. http://factfinder2.census.gov/faces/tableservices/jsf/pages/productview.xhtml?src=bkmk. Retrieved February 13, 2013. ^ "Boston city, Massachusetts—DP03. Selected Economic Characteristics 2007–2011 American Community Survey 5-Year Estimates". United States Census Bureau. 2011. http://factfinder2.census.gov/faces/tableservices/jsf/pages/productview.xhtml?pid=ACS_11_5YR_DP03. Retrieved February 13, 2013. ^ a b c d "Massachusetts – Race and Hispanic Origin for Selected Cities and Other Places: Earliest Census to 1990". U.S. Census Bureau. http://www.census.gov/population/www/documentation/twps0076/twps0076.html. Retrieved April 20, 2012. ^ "Boston, Massachusetts". Sperling's BestPlaces. 2008. Archived from the original on March 18, 2008. https://web.archive.org/web/20080318095419/http://www.bestplaces.net/city/Boston_MA-PEOPLE-52507000010.aspx. Retrieved April 6, 2008. ^ Jonas, Michael (August 3, 2008). "Majority-minority no more?". The Boston Globe. http://www.boston.com/news/local/articles/2008/08/03/majority_minority_no_more/. Retrieved November 30, 2009. ^ "Boston 2010 Census: Facts & Figures". Boston Redevelopment Authority News. March 23, 2011. http://www.bostonredevelopmentauthoritynews.org/2011/03/23/boston-census-facts-figures/. Retrieved February 13, 2012. ^ Data Access and Dissemination Systems (DADS). "American FactFinder – Results". census.gov. http://factfinder.census.gov/faces/tableservices/jsf/pages/productview.xhtml?pid=ACS_15_1YR_B03002&prodType=table. ^ "Boston city, Massachusetts—DP02, Selected Social Characteristics in the United States 2007–2011 American Community Survey 5-Year Estimates". United States Census Bureau. 2011. http://factfinder2.census.gov/faces/tableservices/jsf/pages/productview.xhtml?src=bkmk. Retrieved February 13, 2013. ^ "SELECTED POPULATION PROFILE IN THE UNITED STATES 2011-2013 American Community Survey 3-Year Estimates - Chinese alone, Boston city, Massachusetts". United States Census Bureau. http://factfinder.census.gov/bkmk/table/1.0/en/ACS/13_3YR/S0201/1600000US2507000/popgroup~016. Retrieved January 15, 2016. ^ "New Bostonians 2009". Boston Redevelopment Authority/Research Division. October 2009. http://www.pluralism.org/files/wrgb/civic/New_Bostonians_2009.pdf. Retrieved February 13, 2013. ^ Data Access and Dissemination Systems (DADS). "American FactFinder – Results". census.gov. http://factfinder2.census.gov/faces/tableservices/jsf/pages/productview.xhtml?pid=DEC_10_SF1_QTP10&prodType=table. ^ "SELECTED ECONOMIC CHARACTERISTICS 2008–2012 American Community Survey 5-Year Estimates". U.S. Census Bureau. http://factfinder2.census.gov/faces/tableservices/jsf/pages/productview.xhtml?pid=ACS_12_5YR_DP03&prodType=table. Retrieved March 19, 2014. ^ "ACS DEMOGRAPHIC AND HOUSING ESTIMATES 2008–2012 American Community Survey 5-Year Estimates". U.S. Census Bureau. http://factfinder2.census.gov/faces/tableservices/jsf/pages/productview.xhtml?pid=ACS_12_5YR_DP05&prodType=table. Retrieved March 19, 2014. ^ "HOUSEHOLDS AND FAMILIES 2008–2012 American Community Survey 5-Year Estimates". U.S. Census Bureau. http://factfinder2.census.gov/faces/tableservices/jsf/pages/productview.xhtml?pid=ACS_12_5YR_S1101&prodType=table. Retrieved March 19, 2014. ^ "The Association of Religion Data Archives - Maps & Reports". http://www.thearda.com/rcms2010/r/m/14460/rcms2010_14460_metro_name_2010.asp. ^ a b "Jewish Population in the United States 2002". Center for Judaic Studies and Contemporary Jewish Life. http://www.jewishdatabank.org/ajyb/ajy-2003.pdf. Retrieved January 4, 2010. ^ "County Membership Report". The Association of Religion Data Archives. http://www.thearda.com/mapsReports/reports/counties/25025_2000.asp. Retrieved January 4, 2010. ^ Florida, Richard (May 8, 2012). "What Is the World's Most Economically Powerful City?". The Atlantic Monthly Group. http://www.theatlantic.com/business/archive/2012/05/what-is-the-worlds-most-economically-powerful-city/256841/. Retrieved February 21, 2013. ^ "Global city GDP rankings 2008–2025". Pricewaterhouse Coopers. https://www.ukmediacentre.pwc.com/Content/Detail.asp?ReleaseID=3421&NewsAreaID=2. Retrieved November 20, 2009. ^ McSweeney, Denis M.. "The prominence of Boston area colleges and universities". http://www.bls.gov/opub/mlr/2009/06/regrep.pdf. Retrieved April 25, 2014. ^ "Leadership Through Innovation: The History of Boston's Economy" (PDF). Boston Redevelopment Authority. 2003. Archived from the original on October 6, 2010. https://web.archive.org/web/20101006105936/http://bostonredevelopmentauthority.org/pdf/ResearchPublications//pdr_563.pdf. Retrieved May 6, 2012. ^ "Milken report: The Hub is still tops in life sciences". The Boston Globe. May 19, 2009. Archived from the original on May 23, 2009. https://web.archive.org/web/20090523105412/http://www.boston.com/business/ticker/2009/05/milken_report_h.html. Retrieved August 25, 2009. ^ "Top 100 NIH Cities". SSTI.org. 2004. http://www.ssti.org/Digest/Tables/022006t.htm. Retrieved February 19, 2007. ^ "Boston: The City of Innovation". TalentCulture. August 2, 2010. http://www.talentculture.com/feature/boston-the-city-of-innovation/. Retrieved August 30, 2010. ^ "Venture Investment - Regional Aggregate Data". National Venture Capital Association. http://nvca.org/research/venture-investment/. Retrieved January 17, 2016. ^ "Tourism Statistics & Reports". Greater Boston Convention and Visitors Bureau. 2009–2011. http://www.bostonusa.com/partner/press/pr/statistics. Retrieved February 20, 2013. ^ "GBCVB, Massport Celebrate Record Number of International Visitors in 2014". Greater Boston Convention and Visitors Bureau. August 21, 2015. http://www.bostonusa.com/partner/press/press-releases/view/GBCVB-Massport-Celebrate-Record-Number-of-International-Visitors-in-2014-/113/. Retrieved January 17, 2016. ^ "About the Port – History". Massport. 2007. http://www.massport.com/ports/about_histo.html. Retrieved April 28, 2007. ^ "Top 10 Cities For A Career In Finance". Investopedia.com. http://www.investopedia.com/articles/financialcareers/top-10-financial-career-cities.asp. Retrieved May 13, 2010. ^ "History of Boston's Economy – Growth and Transition 1970–1998". Boston Redevelopment Authority. November 1999. p. 9. Archived from the original on July 23, 2013. https://web.archive.org/web/20130723053431/http://www.bostonredevelopmentauthority.org/PDF/ResearchPublications/pdr529.pdf. Retrieved March 12, 2013. ^ "General Electric To Move Corporate Headquarters To Boston". CBS Local Media. January 13, 2016. http://boston.cbslocal.com/2016/01/13/general-electric-corporate-headquarters-boston-ge/. Retrieved January 15, 2016. ^ "Metco Program". Massachusetts Department of Elementary & Secondary Education. June 16, 2011. http://www.doe.mass.edu/metco/. Retrieved February 20, 2013. ^ "Academic Ranking of World Universities 2015". ShanghaiRanking Consultancy. http://www.shanghairanking.com/ARWU2015.html. Retrieved January 16, 2016. ^ "CWUR 2015 – World University Rankings". Center for World University Rankings. http://cwur.org/2015/. Retrieved January 16, 2016. ^ "Brainpower Triangle Cambridge Massachusetts - New Media Technology and Tech Clusters". the New Media. http://www.thenew-media.info/cambridge-usa.htm. Retrieved May 8, 2016. ^ Kladko, Brian (April 20, 2007). "Crimson Tide". Boston Business Journal. http://boston.bizjournals.com/boston/stories/2007/04/23/story2.html?i=79430&b=1177300800%5E1449823. Retrieved April 28, 2007. ^ "The MIT Press: When MIT Was "Boston Tech"". The MIT Press. 2013. https://mitpress.mit.edu/books/when-mit-was-boston-tech. Retrieved March 5, 2013. ^ "Boston Campus Map". Tufts University. 2013. http://campusmaps.tufts.edu/boston/. Retrieved February 13, 2013. ^ "MEMBER INSTITUTIONS AND YEARS OF ADMISSION". http://www.aau.edu/about/article.aspx?id=5476. Retrieved July 17, 2014. ^ "City of Boston". Boston University. 2014. Archived from the original on 2014-02-22. https://web.archive.org/web/20140222040537/http://www.bu.edu/metinternational/discover/city-of-boston/. Retrieved February 9, 2014. ^ "The Largest Employers in the City of Boston" (PDF). Boston Redevelopment Authority. 1996–1997. Archived from the original on July 23, 2013. https://web.archive.org/web/20130723052530/http://www.bostonredevelopmentauthority.org/PDF/ResearchPublications//pdr509.pdf. Retrieved May 6, 2012. ^ "Northeastern University". U.S. News and World Reports. 2013. http://colleges.usnews.rankingsandreviews.com/best-colleges/northeastern-university-2199. Retrieved February 5, 2013. ^ "Suffolk University". U.S. News and World Reports. 2013. http://colleges.usnews.rankingsandreviews.com/best-colleges/suffolk-university-2218. Retrieved February 13, 2013. ^ Laczkoski, Michelle (February 27, 2006). "BC outlines move into Allston-Brighton". The Daily Free Press (Boston University). http://dailyfreepress.com/2006/02/27/bc-outlines-move-into-allston-brighton/. Retrieved May 6, 2012. ^ "Boston By The Numbers". City of Boston. http://www.bostonredevelopmentauthority.org/getattachment/3488e768-1dd4-4446-a557-3892bb0445c6/. Retrieved June 9, 2014. ^ "History of NESL". New England School of Law. 2010. http://www.nesl.edu/engaged/history.cfm. Retrieved October 17, 2010. ^ "Emerson College". U.S. News and World Reports. 2013. http://colleges.usnews.rankingsandreviews.com/best-colleges/emerson-college-2146. Retrieved February 6, 2013. ^ "A Brief History of New England Conservatory". New England Conservatory of Music. 2007. http://www.newenglandconservatory.edu/reports_factsheets/briefhistory.html. Retrieved April 28, 2007. ^ Winship, Christopher (March 2002). "End of a Miracle?" (PDF). Harvard University. Archived from the original on May 22, 2012. https://web.archive.org/web/20120522063733/http://www.wjh.harvard.edu/soc/faculty/winship/End_of_a_Miracle.pdf. Retrieved February 19, 2007. ^ "2008 Crime Summary Report". The Boston Police Department Office Research and Development. 2008. p. 5. http://www.cityofboston.gov/Images_Documents/2008Crime%20Summary_tcm3-8952.pdf. Retrieved February 20, 2013. ^ "Part One Crime Reported by the Boston Police Department 1/1/2014 - 12/20/2014 vs. 1/1/2015 - 12/20/2015". Boston Police Department. http://static1.squarespace.com/static/5086f19ce4b0ad16ff15598d/t/567850aea128e6372fb22c16/1450725550687/Weekly+Crime+Overview+12-20-15+3.pdf. Retrieved January 16, 2016. ^ Baker, Billy (May 25, 2008). "Wicked good Bostonisms come, and mostly go". The Boston Globe. http://www.boston.com/news/local/massachusetts/articles/2008/05/25/my_word/. Retrieved May 2, 2009. ^ "The world's greatest orchestras". http://www.gramophone.co.uk/editorial/the-world%E2%80%99s-greatest-orchestras. ^ Cox, Trevor (March 5, 2015). "10 of the world's best concert halls". The Guardian. http://www.theguardian.com/travel/2015/mar/05/10-worlds-best-concert-halls-berlin-boston-tokyo. ^ "Who We Are". Handel and Haydn Society. 2007. Archived from the original on 2007-04-27. https://web.archive.org/web/20070427052402/http://www.handelandhaydn.org/learn/whoweare/whoweare_home.htm. Retrieved April 28, 2007. ^ "Boston Harborfest – About". Boston Harborfest Inc.. 2013. Archived from the original on May 6, 2013. https://web.archive.org/web/20130506053501/http://www.bostonharborfest.com/about.html. Retrieved March 5, 2013. ^ "Our Story: About Us". Boston 4 Celebrations Foundation. 2010. http://www.july4th.org/Our_Story/About_Us/. Retrieved March 5, 2013. ^ Ouroussoff, Nicolai (December 8, 2006). "Expansive Vistas Both Inside and Out". The New York Times. http://www.nytimes.com/2006/12/08/arts/design/08ica.html. Retrieved March 5, 2013. ^ "History of The Boston Athenaeum". Boston Athenæum. 2012. http://www.bostonathenaeum.org/node/38. Retrieved March 5, 2013. ^ "First Church in Boston History". First Church in Boston. http://www.firstchurchboston.org/about/history. Retrieved November 12, 2013. ^ "EPA AirCompare Historical Profile". Environmental Protection Agency. http://www.epa.gov/cgi-bin/broker?_service=aircomp&_debug=0&_program=dataprog.wcj_byyearhealth.sas&geocode=25025&condition=none&citycounty=county. Retrieved December 26, 2014. ^ "The Green District Allston". Encore Realty. http://www.allaccessboston.com/Green-District-Allston. ^ a b "About Your Community". goodguide.com. http://scorecard.goodguide.com/community/index.tcl?zip_code=02108&set_community_zipcode_cookie_p=t&x=16&y=7. ^ "Where Has All the Water Gone? Left Piles Rotting ...". bsces.org. http://www.bsces.org/index.cfm/page/Where-Has-All-the-Water-Gone-Left-Piles-Rotting.../cdid/10778/pid/10371. ^ Abraham, Yvonne (July 22, 2007). "Pure water, right on Tap". The Boston Globe. http://www.boston.com/news/local/articles/2007/07/22/pure_water_right_on_tap/. Retrieved June 7, 2011. ^ Zezima, Katie (June 16, 2011). "Long Memory or Short, Boston Fans Savor Success". The New York Times. http://www.nytimes.com/2011/06/17/sports/boston-fans-savor-a-decade-of-sports-success.html?_r=0. Retrieved June 16, 2011. ^ "The New Title Town USA - Video - SI.com". Sports Illustrated. February 4, 2012. Archived from the original on 2012-02-05. https://web.archive.org/web/20120205013119/http://sportsillustrated.cnn.com/video/nfl/2012/02/04/020412.boston_sports_sml.SportsIllustrated/index.html. Retrieved February 4, 2012. ^ "SPORTS CHART OF THE DAY: Boston Is The New "Title Town"". Business Insider. June 16, 2011. http://www.businessinsider.com/sports-chart-of-the-day-boston-is-the-new-title-town-2011-6. Retrieved January 22, 2013. ^ Arsenault, Mark (November 23, 2014). "Boston bidders hope time is right for frugal Games". http://www.bostonglobe.com/metro/2014/11/22/boston-bidders-hope-time-right-for-frugal-games/Gg72bgH4vHrvQ7dj4G6COO/story.html. ^ "Fenway Park". ESPN. 2013. http://espn.go.com/travel/stadium/_/s/mlb/id/2/fenway-park. Retrieved February 5, 2013. ^ Abrams, Roger I. (February 19, 2007). "Hall of Fame third baseman led Boston to first AL pennant". National Baseball Hall of Fame and Museum. Archived from the original on September 2, 2007. https://web.archive.org/web/20070902113322/http://www.baseballhalloffame.org/news/article.jsp?ymd=20070219&content_id=780&vkey=hof_news. Retrieved April 1, 2009. ^ "1903 World Series – Major League Baseball: World Series History". Major League Baseball at MLB.com. 2007. http://mlb.mlb.com/NASApp/mlb/mlb/history/postseason/mlb_ws_recaps.jsp?feature=1903. Retrieved February 18, 2007. Please note: This source, like many others, uses the erroneous "Pilgrims" name that is debunked by the Nowlin reference following. ^ Bill Nowlin (2008). "The Boston Pilgrims Never Existed". Baseball Almanac. http://www.baseball-almanac.com/articles/boston_pilgrims_story.shtml. Retrieved April 3, 2008. ^ "Braves History". Atlanta Brave (MLB). 2013. http://atlanta.braves.mlb.com/atl/history/. Retrieved February 5, 2013. ^ "National Hockey League (NHL) Expansion History". Rauzulu's Street. 2004. http://www.rauzulusstreet.com/hockey/nhlhistory/nhlhistory.html. Retrieved April 1, 2009. ^ "NBA History – NBA Growth Timetable". Basketball.com. http://www.basketball.com/nba/history.shtml. Retrieved April 1, 2009. ^ "NBA Finals: All-Time Champions". NBA. 2007. http://www.nba.com/history/finals/champions.html. Retrieved February 20, 2007. ^ "The History of the New England Patriots". New England Patriots. 2007. Archived from the original on May 19, 2011. https://web.archive.org/web/20110519121830/http://www.patriots.com/history/index.cfm?ac=History. Retrieved April 29, 2007. ^ Springer, Shira (April 11, 2009). "Breakers shoot for foothold in local market". The Boston Globe. http://www.boston.com/sports/soccer/articles/2009/04/11/breakers_shoot_for_foothold_in_local_market/. Retrieved June 27, 2009. ^ "Play It Forward Sport and STX Announce Semi-Professional Women's Lacrosse League" (Press release). www.playitforwardsport.org. May 21, 2015. http://www.playitforwardsport.org/2015/05/play-it-forward-sport-and-stx-announce.html. Retrieved June 1, 2016. ^ "B.A.A. Boston Marathon Race Facts". Boston Athletic Association. 2007. http://www.bostonmarathon.org/BostonMarathon/RaceFacts.asp. Retrieved April 29, 2007. ^ "Crimson Rules College Lightweights at Head of the Charles". Harvard Athletic Communications. October 23, 2011. http://www.gocrimson.com/sports/mcrew-lw/2011-12/releases/20111024aapf79. Retrieved May 6, 2012. ^ "Franklin Park". City of Boston. 2007. http://www.cityofboston.gov/parks/emerald/Franklin_Park.asp. Retrieved April 28, 2007. ^ "Open Space Plan 2008–2014: Section 3 Community Setting". City of Boston Parks & Recreation. January 2008. http://www.cityofboston.gov/parks/pdfs/OSP2010/OSP0814_3_CommunitySetting.pdf. Retrieved February 21, 2013. ^ Patton, Zach (January 2012). "The Boss of Boston: Mayor Thomas Menino". Governing. http://www.governing.com/topics/politics/gov-boss-of-boston-mayor-thomas-menino.html. Retrieved February 5, 2013. ^ "Boston City Charter". City of Boston. July 2007. p. 59. http://www.cityofboston.gov/Images_Documents/2007%20the%20charter%20draft20%20%28final%20draft1%20with%20jumps%29_tcm3-16428.pdf. Retrieved February 5, 2013. ^ "The Boston Public Schools at a Glance: School Committee". Boston Public Schools. March 14, 2007. Archived from the original on April 3, 2007. https://web.archive.org/web/20070403011648/http://boston.k12.ma.us/bps/bpsglance.asp. Retrieved April 28, 2007. ^ "Massachusetts Real Estate Portfolio". United States General Services Administration. http://www.gsa.gov/portal/content/104959. Retrieved March 11, 2014. ^ "Massachusetts's Representatives – Congressional District Maps". GovTrack.us. 2007. http://www.govtrack.us/congress/findyourreps.xpd?state=MA. Retrieved April 28, 2007. ^ Irons, Meghan E. (2016-08-17). "City Hall is always above average — if you ask City Hall". The Boston Globe. http://www.bostonglobe.com/metro/2016/08/17/city-hall-always-above-average-you-ask-city-hall/GUvNcsQlIhJYt8SPgjLzCN/story.html?s_campaign=email_BG_TodaysHeadline&s_campaign=#comments. Retrieved 2016-08-18. ^ "The Commonwealth of Massachusetts: Enrollment Breakdown as of 10/17/2012" (PDF). Massachusetts Elections Division. November 1, 2012. p. 16. http://www.sec.state.ma.us/ele/ele12/06NOV2012_ST_Party_Enrollment_Stats_3.pdf. Retrieved March 7, 2013. ^ "Editor's message about changes at the Monitor". The Christian Science Monitor. March 27, 2009. http://www.csmonitor.com/2009/0327/p09s01-coop.html. Retrieved July 13, 2009. ^ "WriteBoston – T.i.P". City of Boston. 2007. Archived from the original on February 7, 2007. https://web.archive.org/web/20070207050847/http://www.cityofboston.gov/bra/writeboston/TIP.asp. Retrieved April 28, 2007. ^ Diaz, Johnny (September 6, 2008). "A new day dawns for a Spanish-language publication". The Boston Globe. http://www.boston.com/lifestyle/articles/2008/09/06/a_new_day_dawns_for_a_spanish_language_publication/. Retrieved February 4, 2013. ^ Diaz, Johnny (January 26, 2011). "Bay Windows acquires monthly paper". The Boston Globe. http://www.boston.com/business/articles/2011/01/26/bay_windows_acquires_monthly_paper/. Retrieved February 4, 2013. ^ "Arbitron – Market Ranks and Schedule, 1–50". Arbitron. Fall 2005. http://www.arbitron.com/radio_stations/mm001050.asp. Retrieved February 18, 2007. ^ "AM Broadcast Classes; Clear, Regional, and Local Channels". Federal Communications Commission. January 20, 2012. Archived from the original on 2012-04-30. https://web.archive.org/web/20120430090244/http://www.fcc.gov/encyclopedia/am-broadcast-station-classes-clear-regional-and-local-channels. Retrieved February 20, 2013. ^ "About Us: From our President". WGBH. 2013. http://www.wgbh.org/about/index.cfm. Retrieved March 5, 2013. ^ "The Route 128 tower complex". The Boston Radio Archives. 2007. http://www.bostonradio.org/route-128.html. Retrieved April 28, 2007. ^ "Made In Mass". MA Film Office. http://www.mafilm.org/made-in-mass/. Retrieved February 2, 2015. ^ "New England Film". NewEnglandFilm. http://www.NewEnglandFilm.com. Retrieved February 8, 2015. ^ "About MASCO". MASCO – Medical Academic and Scientific Community Organization. 2007. http://www.masco.org/masco/about-masco. Retrieved May 6, 2012. ^ "Facility Listing Report". United States Department of Veterans Affairs. 2007. http://www1.va.gov/directory/guide/rpt_fac_list.cfm?isflash=0. Retrieved April 28, 2007. ^ "About BPHC – The Nation's First Health Department". Boston Public Health Commission. 2013. Archived from the original on April 17, 2009. https://web.archive.org/web/20090417030443/http://www.bphc.org/about/Pages/Home.aspx. Retrieved February 5, 2013. ^ "Hospital Overview". Massachusetts General Hospital. 2013. http://www.massgeneral.org/about/overview.aspx. Retrieved February 5, 2013. ^ "Boston Medical Center – Facts" (PDF). Boston Medical Center. November 2006. Archived from the original on February 3, 2007. https://web.archive.org/web/20070203221200/http://www.bmc.org/about/facts06.pdf. Retrieved February 21, 2007. ^ "Boston Medical Center". Children's Hospital Boston. 2007. Archived from the original on August 15, 2007. https://web.archive.org/web/20070815192727/http://www.childrenshospital.org/bcrp/Site2213/mainpageS2213P2.html. Retrieved November 14, 2007. ^ "About Logan". Massport. 2007. http://www.massport.com/logan/about.asp. Retrieved May 9, 2007. ^ "About Port of Boston". Massport. 2013. http://www.massport.com/port-of-boston/About%20Port%20of%20Boston/AboutPortofBoston.aspx. Retrieved March 3, 2013. ^ Shurtleff, Arthur A. (January 1911). "The Street Plan of the Metropolitan District of Boston". Landscape Architecture 1: 71–83. ^ "Census and You" (PDF). US Census Bureau. January 1996. p. 12. http://www.census.gov/prod/1/gen/pio/cay961a2.pdf. Retrieved February 19, 2007. ^ a b "Boston: Light Rail Transit Overview". Light Rail Progress. May 2003. http://www.lightrailnow.org/facts/fa_bos001.htm. Retrieved February 19, 2007. ^ "Westwood—Route 128 Station, MA (RTE)". Amtrak. 2007. http://www.amtrak.com/servlet/ContentServer?pagename=Amtrak/am2Station/Station_Page&c=am2Station&cid=1080080550818&ssid=93. Retrieved May 9, 2007. ^ "Boston—South Station, MA (BOS)". Amtrak. 2007. http://www.amtrak.com/servlet/ContentServer?pagename=Amtrak/am2Station/Station_Page&c=am2Station&cid=1080080550772&ssid=93. Retrieved May 9, 2007. ^ Of cities over 250,000 "Carfree Database Results – Highest percentage (Cities over 250,000)". Bikes at Work Inc.. 2007. http://www.bikesatwork.com/carfree/census-lookup.php?state_select=*&lower_pop=250000&upper_pop=999999999&sort_num=2&show_rows=25&first_row=0.. Retrieved February 26, 2007. ^ Said, Carolyn (July 20, 2011). "S.F., Oakland in top 10 most walkable U.S. cities". San Francisco Chronicle. http://www.sfgate.com/cgi-bin/article.cgi?f=/c/a/2011/07/20/BUUK1KCC67.DTL&tsp=1. Retrieved July 20, 2011. ^ "The 10 most walkable U.S. cities". MarketWatch. 2011. http://www.marketwatch.com/story/the-10-most-walkable-us-cities-2011-07-20?link=MW_popular. Retrieved July 20, 2011. ^ "Boston". Walk Score. Walk Score. http://www.walkscore.com/MA/Boston. Retrieved June 3, 2015. ^ Zezima, Katie (August 8, 2009). "Boston Tries to Shed Longtime Reputation as Cyclists' Minefield". The New York Times. http://www.nytimes.com/2009/08/09/us/09bike.html?_r=0. Retrieved May 24, 2015. ^ "Bicycle Commuting and Facilities in Major U.S. Cities: If You Build Them, Commuters Will Use Them – Another Look" (PDF). Dill bike facilities. 2003. p. 5. http://www.des.ucdavis.edu/faculty/handy/ESP178/Dill_bike_facilities.pdf. Retrieved April 4, 2007. ^ Katie Zezima (August 9, 2009). "Boston Tries to Shed Longtime Reputation as Cyclists' Minefield". The New York Times. http://www.nytimes.com/2009/08/09/us/09bike.html. Retrieved August 16, 2009. ^ "A Future Best City: Boston". Rodale Inc. Archived from the original on February 11, 2010. https://web.archive.org/web/20100211195827/http://www.bicycling.com/article/0,6610,s1-2-13-17078-1,00.html. Retrieved August 16, 2009. ^ "Is Bicycle Commuting Really Catching On? And if So, Where?". The Atlantic Media Company. http://www.theatlanticcities.com/commute/2011/09/substantial-increases-bike-ridership-across-nation/161/. Retrieved December 28, 2011. ^ Moskowitz, Eric (April 21, 2011). "Hub set to launch bike-share program". The Boston Globe. http://www.boston.com/news/local/massachusetts/articles/2011/04/21/boston_set_to_launch_bike_share_program/. Retrieved February 5, 2013. ^ Fox, Jeremy C. (March 29, 2012). "Hubway bike system to be fully launched by April 1". The Boston Globe. http://articles.boston.com/2012-03-29/yourtown/31255679_1_bike-stations-miles-of-bike-lane-new-bike-lines. Retrieved April 20, 2012. ^ Franzini, Laura E. (August 8, 2012). "Hubway expands to Brookline, Somerville, Cambridge". The Boston Globe. http://www.boston.com/yourtown/news/cambridge/2012/08/hubway_expands_to_brookline_so.html. Retrieved March 15, 2013. ^ "Hubway Bikes Boston | PBSC" (in en-US). https://www.pbsc.com/city/boston/. ^ RedEye. "Divvy may test-drive helmet vending machines at stations". http://www.redeyechicago.com/news/redeye-divvy-bikes-helmets-vending-machine-20150507-story.html. ^ a b c "Boston Sister Cities". The City of Boston. Archived from the original on February 8, 2009. https://web.archive.org/web/20090208224246/http://www.cityofboston.gov/arts/sistercity.asp. Retrieved April 5, 2009. ^ "Sister Cities of Kyoto City". City of Kyoto. Archived from the original on January 21, 2014. https://web.archive.org/web/20140121151906/http://www.city.kyoto.lg.jp/sogo/page/0000083407.html. Retrieved January 21, 2014. ^ "Strasbourg, twin city". City and Urban Community of Strasbourg. http://www.en.strasbourg.eu/en/europe-international/partnerships-and-solidarity/strasbourg-twin-city/. Retrieved February 17, 2013. ^ "Highlights of fifty years 1960–2010". Boston/Strasbourg Sister City Association (BSSCA). http://boston-strasbourg.webs.com/history.htm. Retrieved February 17, 2013. ^ "Twinning agreements – Boston". Barcelona City Council. http://w3.bcn.es/XMLServeis/XMLHomeLinkPl/0,4022,229724149_257218473_3,00.html. Retrieved April 5, 2009. ^ "Barcelona internacional – Ciutats agermanades" (in Catalan). 2006–2009 Ajuntament de Barcelona. http://w3.bcn.es/XMLServeis/XMLHomeLinkPl/0,4022,229724149_257215678_1,00.html. Retrieved July 13, 2009. ^ "The twin cities of Padua" (in Italian). Padovanet. Comune di Padova. June 4, 2008. http://www.padovanet.it/dettaglio.jsp?id=2867. Retrieved April 5, 2009. ^ "Sister cities – Boston". City of Melbourne. Archived from the original on 2009-09-21. https://web.archive.org/web/20090921174607/http://www.melbourne.vic.gov.au/info.cfm?top=161&pa=2979&pg=1646. Retrieved April 5, 2009. ^ "International Sister Cities". Taipei City Council. Archived from the original on May 20, 2011. https://web.archive.org/web/20110520154141/http://www.tcc.gov.tw/eng/sister_cities.htm. Retrieved April 5, 2009. ^ Ellement, John (May 12, 2014). "Boston signs sister city agreement with Belfast". Boston Globe. http://www.bostonglobe.com/metro/2014/05/12/boston-inks-sister-city-agreement-with-belfast-home-titanic-and-game-thrones-series/hsCs7ou297cfFalfWCu9TM/story.html. Retrieved May 12, 2014. ^ "Town twinning". Boston Borough Council. Archived from the original on May 20, 2011. https://web.archive.org/web/20110520160801/http://www.boston.gov.uk/index.php?option=com_content&task=view&id=361&Itemid=3531. Retrieved April 5, 2009. ^ "Partnership of the Historic Bostons". Partnership of the Historic Bostons. http://www.historicbostons.com/. Retrieved April 5, 2009. ^ "Strasbourg, Twin City". Strasbourg.eu & Communauté Urbaine. Archived from the original on July 28, 2013. https://web.archive.org/web/20130728153619/http://www.en.strasbourg.eu/en/europe-international/partnerships-and-solidarity/strasbourg-twin-city/. Retrieved August 21, 2013. ^ "Boston" (in Hebrew). Haifa Municipality. http://www.haifa.muni.il/haifa/pages/boston.aspx. Retrieved April 5, 2009. ^ Press Office of the Municipality of Valladolid (September 18, 2007). "Valladolid and Boston have signed a protocol of friendship between the two cities" (in Spanish). Ayuntamiento de Valladolid. http://www.ava.es/modules.php?name=News&file=article&sid=1136. Retrieved April 5, 2009. Christopher, Paul J. (2006). 50 Plus One Greatest Cities in the World You Should Visit. Encouragement Press, LLC.. ISBN 978-1-933766-01-0. Wechter, Eric B. (2009). Fodor's Boston 2009. Random House Digital, Inc.. ISBN 978-1-4000-0699-1. Beagle, Jonathan M.; Penn, Elan (2006). Boston: A Pictorial Celebration. Sterling Publishing Company, Inc.. ISBN 978-1-4027-1977-6. Hantover, Jeffrey; King, Gilbert (2008). City in Time: Boston. Sterling Publishing Company, Inc.. ISBN 978-1-4027-3300-0. O'Connell, James C. (2013). The Hub's Metropolis: Greater Boston's Development from Railroad Suburbs to Smart Growth. MIT Press. ISBN 978-0-262-01875-3. https://books.google.com/books?id=UY5SjKPbaGoC&printsec=frontcover#v=onepage&q&f=false. Price, Michael; Sammarco, Anthony Mitchell (2000). Boston's immigrants, 1840–1925. Arcadia Publishing. ISBN 978-0-7524-0921-4. https://books.google.com/books?id=RbMBOZux_JsC&printsec=frontcover. Krieger, Alex; Cobb, David; Turner, Amy, eds (2001). Mapping Boston. MIT Press. ISBN 978-0-262-61173-2. "Boston". The New Student's Reference Work. Chicago: F. E. Compton and Co. 1914. This page uses content from the English language Wikipedia. The original content was at Boston. The list of authors can be seen in the page history. As with this Familypedia wiki, the content of Wikipedia is available under the Creative Commons License.